It seems like these days a new computer animated film comes out every few months. Most of them just trying to make a quick buck from the kids, featuring voice talent from big celebrities, lacking in originality and an actual story. With Kung Fu Panda, that is not the case. This is a fantastic film filled with “Awesomeness”. Like its animated brothers it does feature a impressive cast but what makes it so great is Jack Black. He really put himself into this character and made it his own. I laughed A LOT, and when i wasn’t laughing i was as excited as a 12 year old boy seeing his favorite action movie. This film is beautiful. From the visual style at the beginning to the breathtaking landscapes of China, everything looks amazing. The fight scenes are entertaining and creative. All round this movie is really fun to watch and it wont matter how old you are. 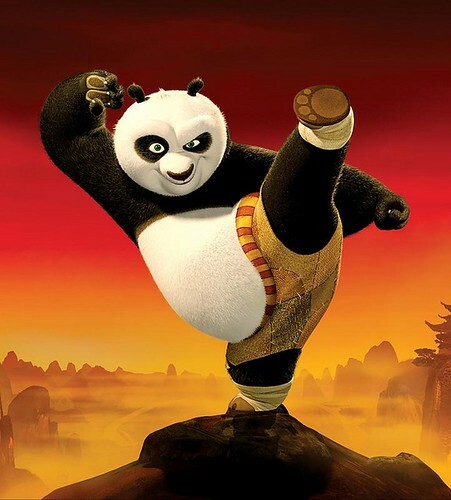 Kung Fu Panda will go down as one of my favorite animated movies of all time. I loved it. Skidoosh.